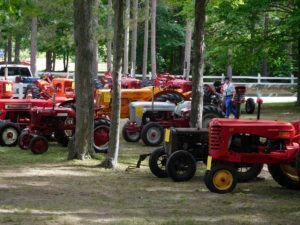 The AuSable Valley Engine & Tractor Club annual show is on June 28 and 29, 2019 (Friday & Saturday) at the lovely wooded Oscoda County Fairgrounds on Caldwell Road off of M33 between Mio and Fairview. Hours – 9 a.m. to 6 p.m. Featuring antique tractor & machine exhibits, gas engines & related machinery, tractor & kid’s games with prizes, flea market, swap meet, craft vendors, tractor pulling, and a tractor parade. One FREE ticket for the drawing to win a peddle tractor given away each day to every child 2 to 7 years old. All farm equipment exhibitors, flea market, craft and swap meet vendors are welcome and it is N/C to set up or exhibit even for non-members. Rustic camping is available. Some sites with electric. Food is available on site. Gate fee is $3.00 per person. Children under 12 years are FREE!! For more information call 989 370-5471or 989 387-4332 or like us on Facebook.